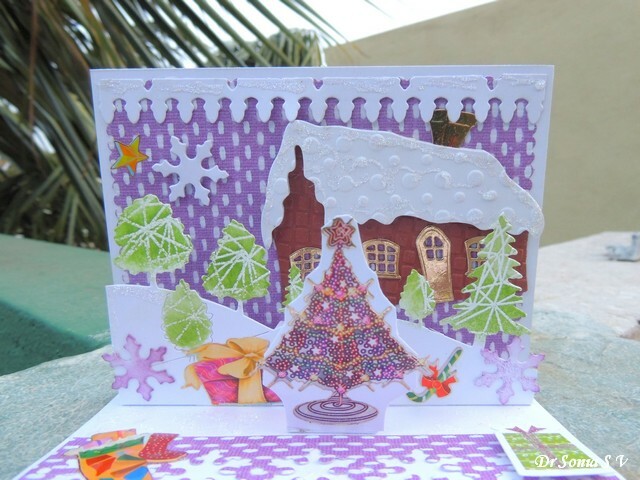 Hi friends Thank you so much for the kind words on my Pop Up Sliding Christmas card! 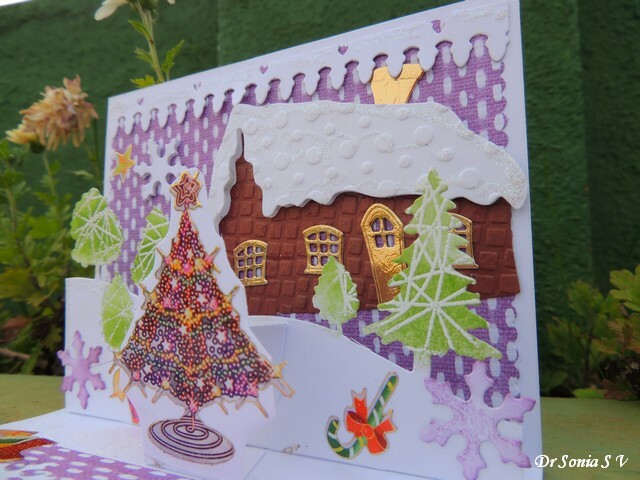 This is another Christmas Pop Up Card with a cozy cottage and a snowy landscape. 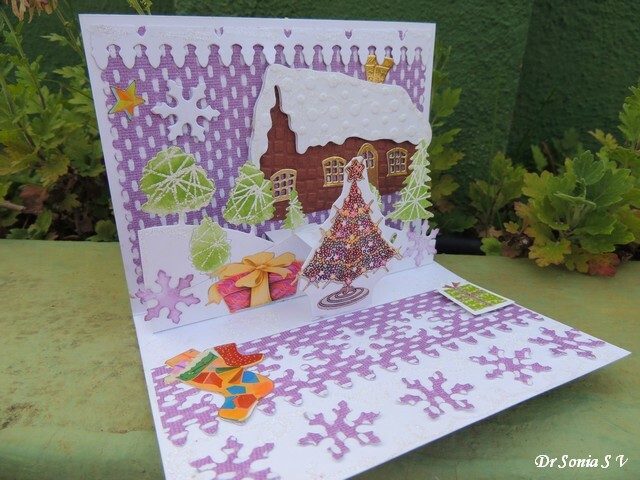 My popup card has a snowy background made from purple pattern paper and 2 layers popped up in front of it. 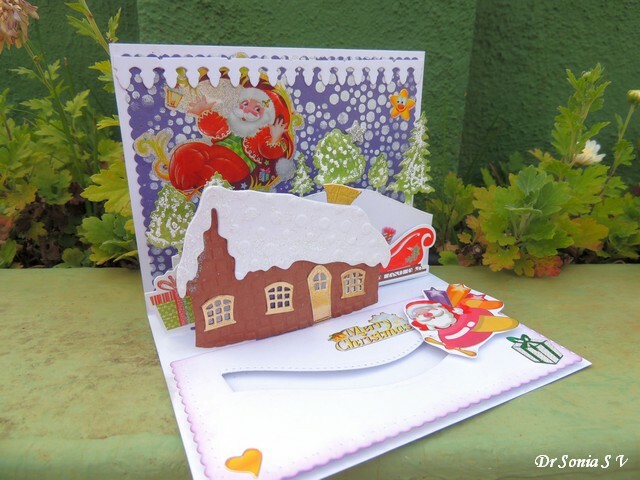 As you can see...I am on a pop up card making spree. 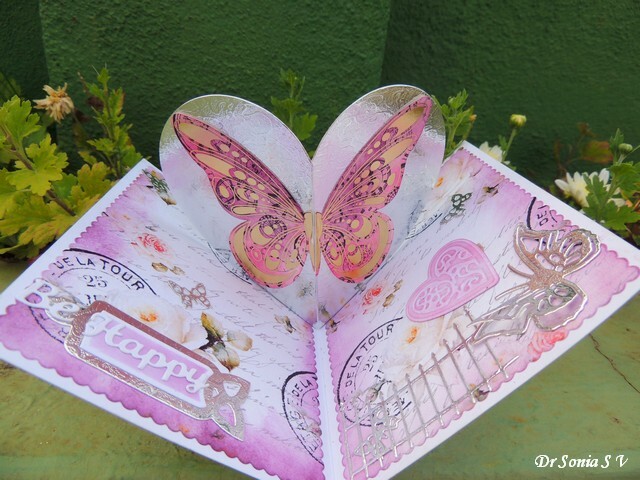 Making a successful pop up card was how I got hooked onto card making!! 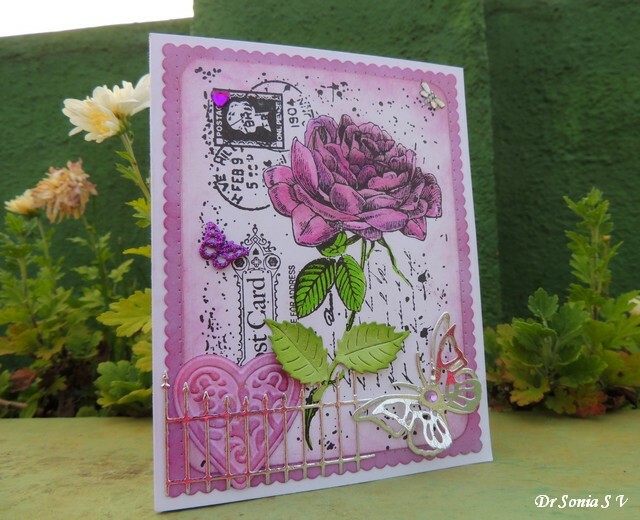 Hi friends sharing a simple card featuring a stamped rose , colored in shades of purple in support of the " The Hop to Stop " Domestic Violence. But a victim can find courage and become free like the butterflies soaring over the fence and the beautiful rose growing up from under the fence and blooming free in the sky! 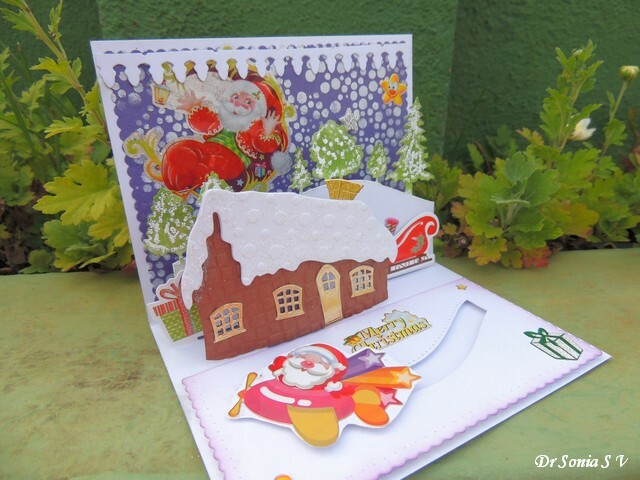 Hi friends, sharing a special Interactive Christmas Card which is my DT project for Rudolph Days Challenge a special Challenge where you can enter your Christmas projects from the 25th to the 30th of each month year long!! 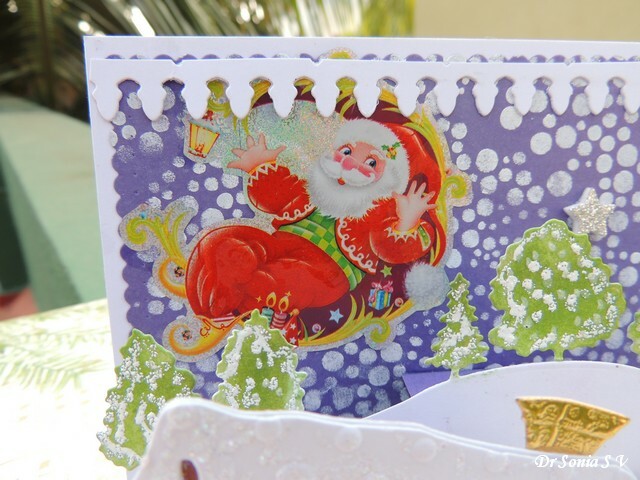 My Christmas card has 3 pop up layers and Santa sliding across the snowy landscape in an aeroplane! 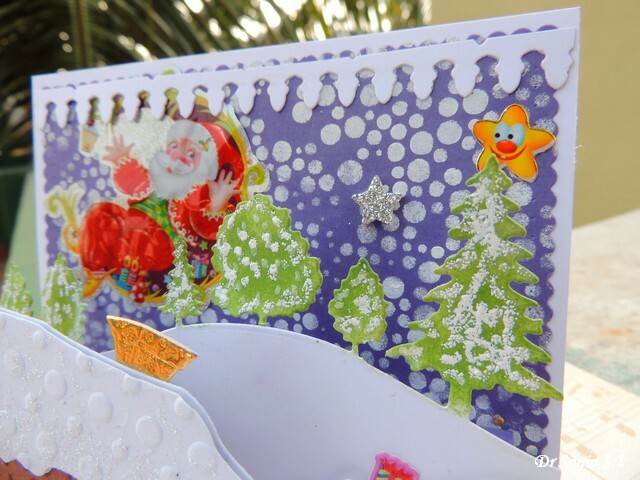 The background has snow falling in the deep purple sky, a cute smiling star and a playful Santa waving from his abode on the moon! 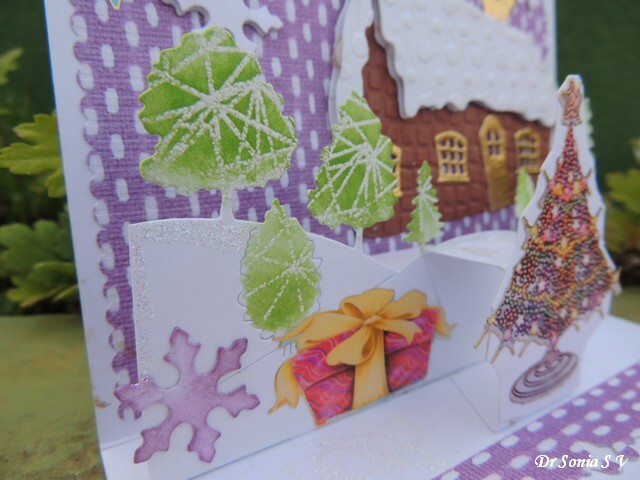 I don't have a lot of stamps to create a background scene so made a simple snowy background by using a stencil and white gesso on purple cardstock! Gesso has a little bit more bulk than white paint so yeah I was happy with my snowfall!! 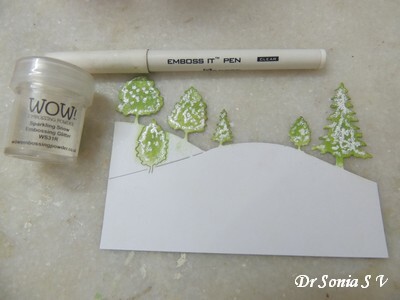 To create the snow laden trees , I used an embossing ink pen and WOW sparkling snow embossing powder on a Tattered Lace Tree Silhouette die cut and colored the embossed trees with mowed lawn Distress Inks . The snowy mountain with the trees were popped up in front of the snowy background . 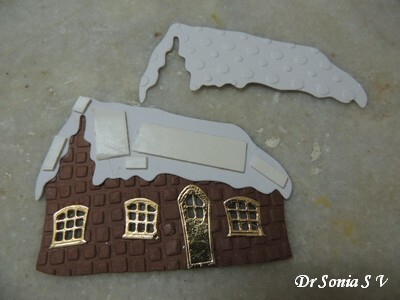 And in front of that I added a cute little cozy looking cottage with a snow-laden rooftop! 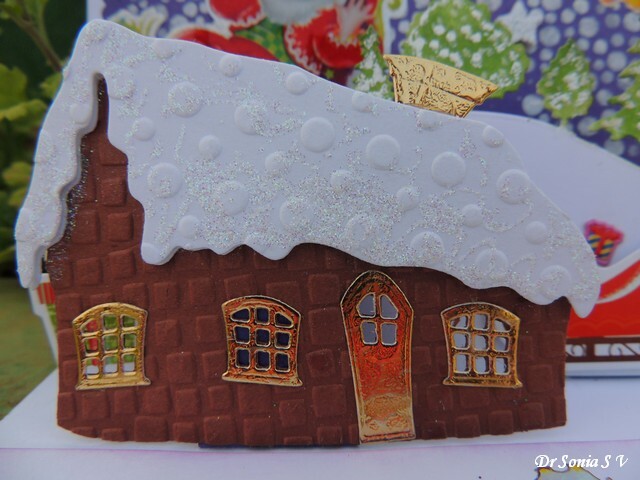 On the embossed roof I added glittery "snow"! Before I got my die cutting machine I used to hand-cut the apertures for my slider cards...now there are dedicated "slider dies" but since I didn't have one of those, I improvised and created a nice curved aperture using Spellbinders border dies I already had. I used the technique of partial die cutting[ also seen in this post: Partial Die Cutting tips] so that the die wouldn't cut all the way. I added Santa to a piece of double sided foam tape which was then stuck on a circle of thick cardstock to form a slider. And my Santa actually spins as he zooms across the snowy mountains! 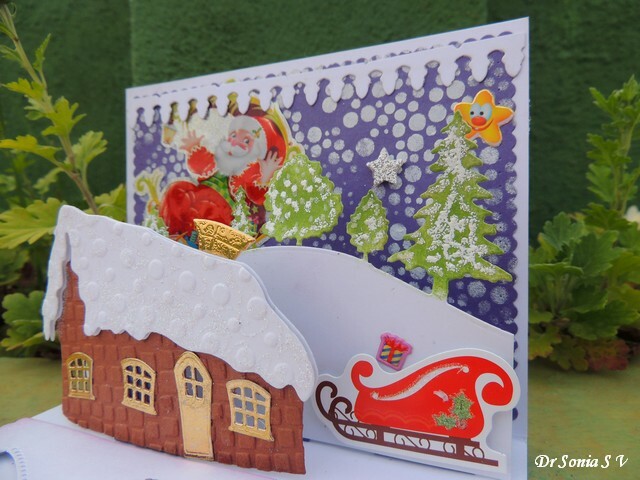 I hope you liked my Christmas pop up + slider card and do participate in Maureen's Rudolph Days Challenge ...she always has such cute prizes! 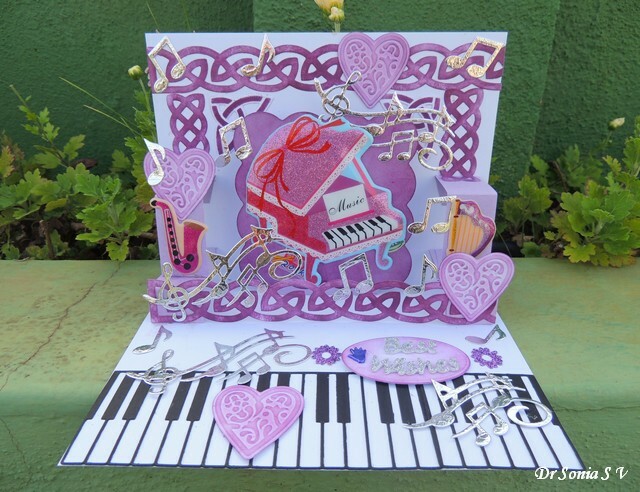 And also do link up to Di's Pixie's Snippets Playground where the theme is always anything goes as long as you use snippets! 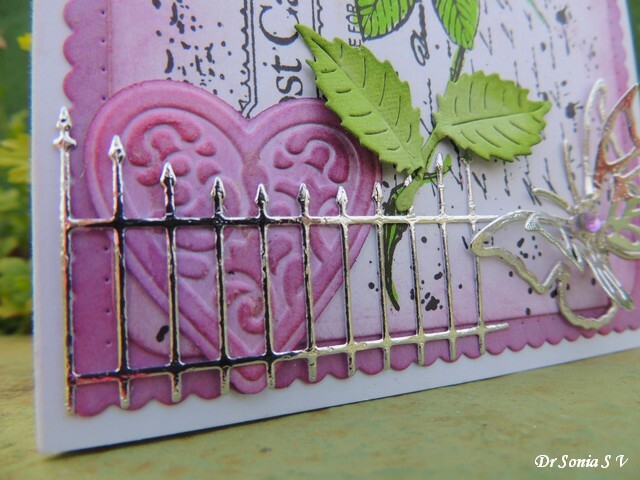 Edited : this card was featured By Di as one of her weekly picks at the Pixie's Snippets Playground ! Thank you so much Di! Though I love making Pop Up Cards , the V fold is one pop up mechanism I find quite tricky...either I misjudge the angulation or the distance the pop up will rise! 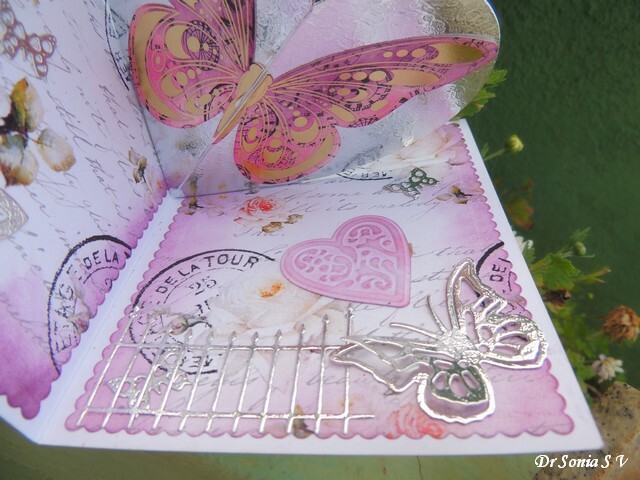 And this one too is far from perfect...the Butterfly pop up in the center is leaning in far too much! 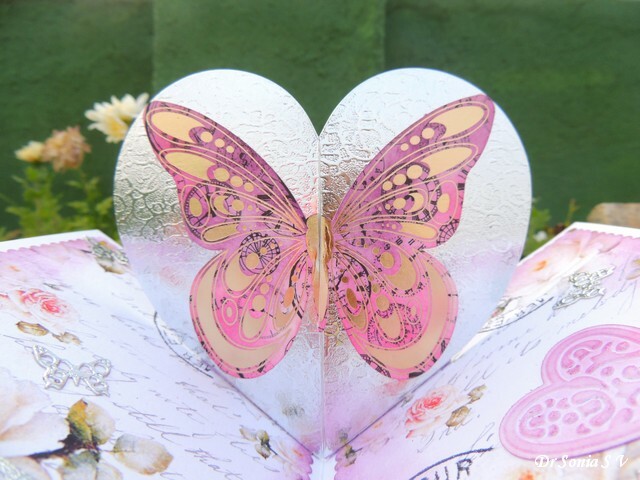 But coming to the positive points, I do love this gorgeous large butterfly which I colored in shades of purple and pink . It is rather a special butterfly as it was sent to me by Mrs A for winning her Butterfly Challenge . Hooray for the generosity of the crafting world!! 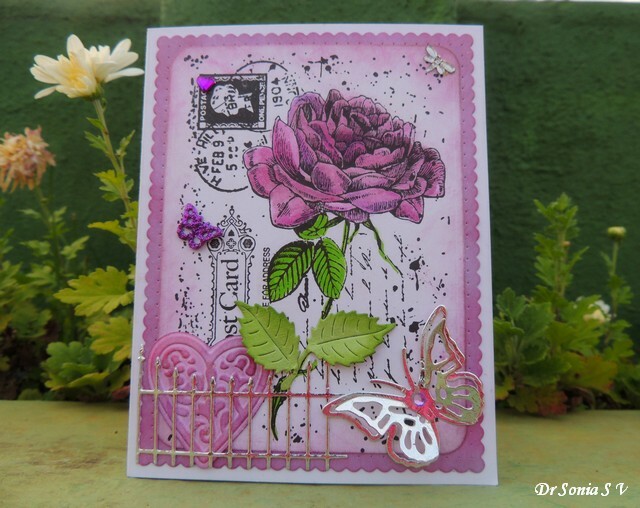 I inked up the lovely floral pattern paper with seedless preserve Distress Inks and added a purple embossed heart and silver butterflies. 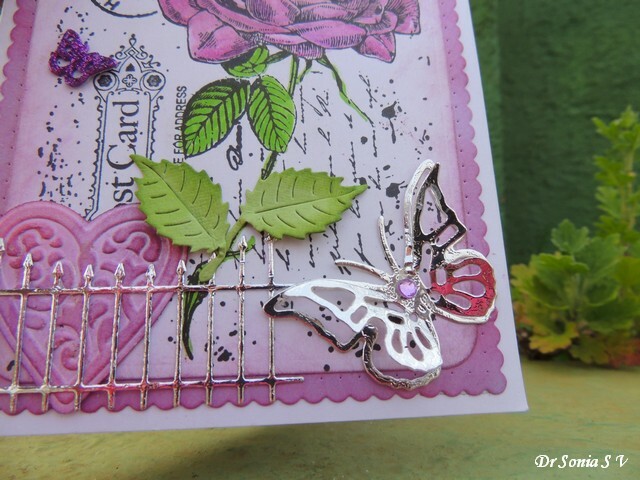 My card is made for "The Hop to Stop domestic violence" and symbolically I added a butterfly trapped under a fence and then soaring free in the sky! Wishing everyone to "be free" like a butterfly and to be "be happy" . 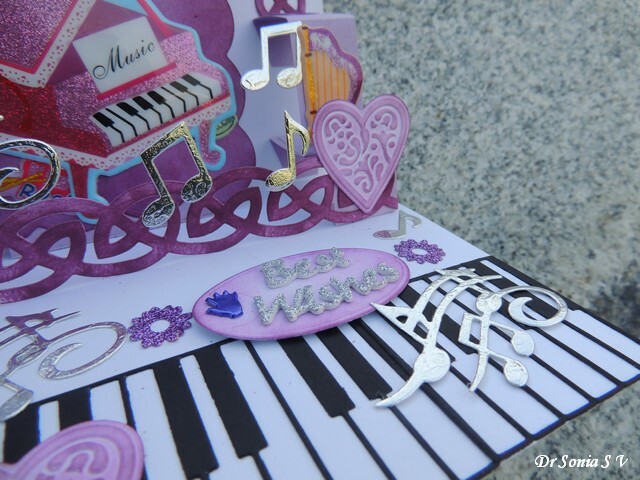 Hi friends I love to decorate the inside of my cards with pop up elements and this happy circus themed card is made to make someone feel happy!! 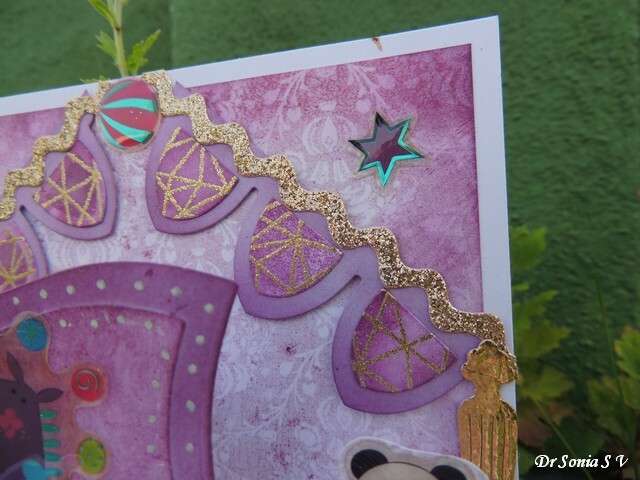 I made the banners by gold embossing Winnie and Walter True stamps and die cutting with a Spellbinders banner die. I used Distress Inks to shade the banner elements , the edges of the pattern paper and the "wonky square" on which the darling hippo is doing her juggling!! 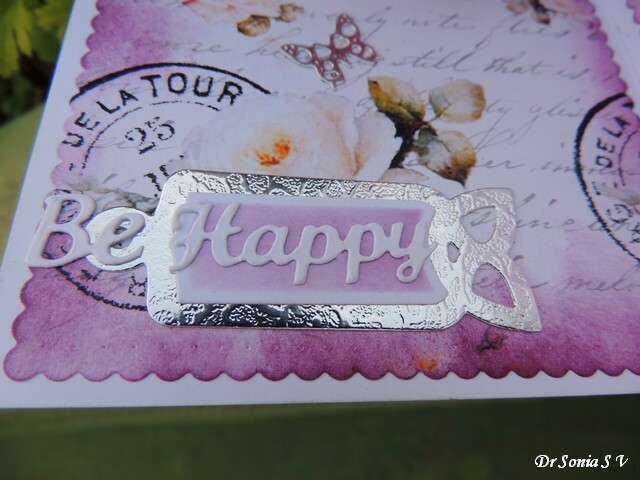 My "Happy" was die cut from designer glitter foam using Winnie and Walter Happy die and the lovely faceted ball beside it was made using Winnie and Walter True stamp and coloring with Distress Inks . I hope you like my "happy" Circus themed Pop Up Card . 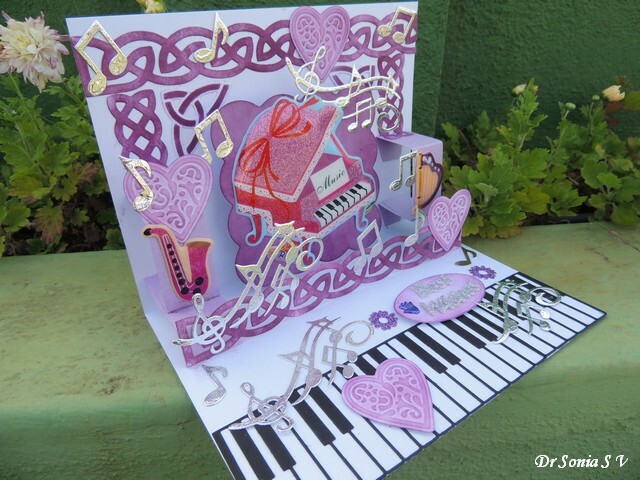 I love making Pop Up Cards and this brightly colored music themed Pop Up Card has lots and lots of layers and fun pop up elements.The central pop up has a grand piano and I added side pop ups for a trumpet and harp . 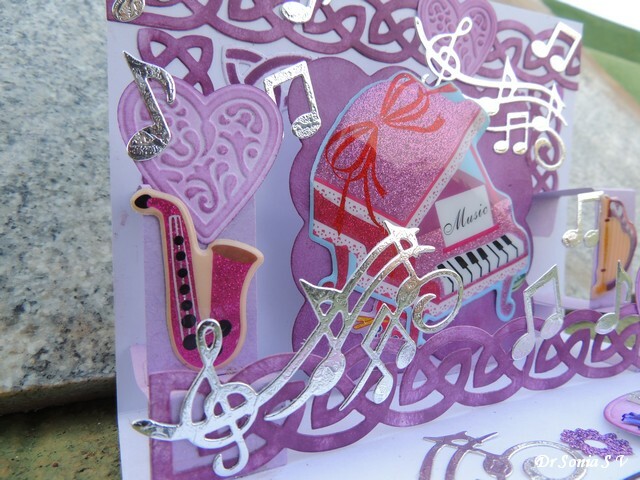 This pop up card has 3 pop up layers and the front most layer has a celtic die cut design running across the breadth of the card with musical notes and an embossed purple heart. 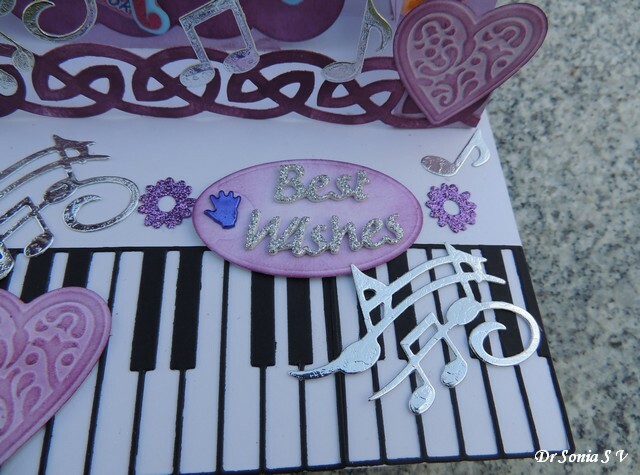 Silver musical notes float up from each pop up element and glimmer beautifully when you open and shut the card. This is one card I wish you could see in person! 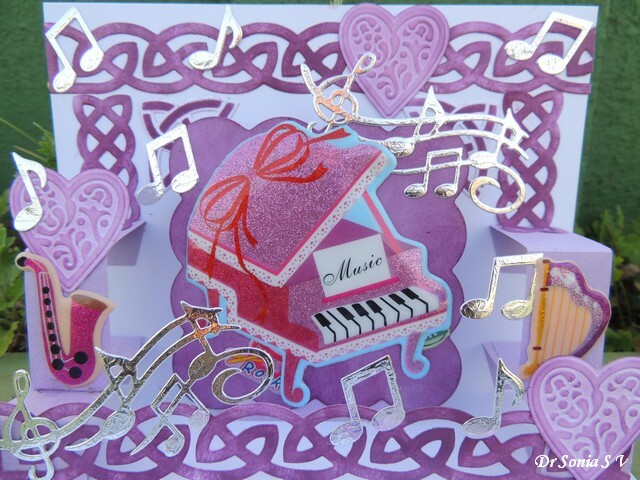 I made this card in purple for Becca's The Hop to Stop Domestic Violence .Music can be so soothing to the troubled soul and uplifting for the broken mind and body. So many ladies in the world are in abusive relationships...suffering in silence, not reaching out for help or reaching out and not getting support. I added the tiny purple hand brad to symbolize a helping hand. A victim of domestic violence needs your help....and help can be something as simple as a hand to hold and a heart to truly listen , support and encourage ! Hope you liked my Pop Up Card ! 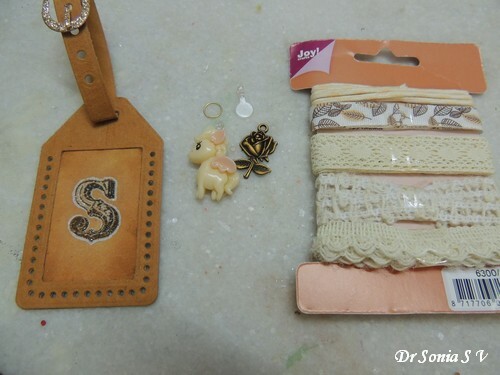 Being able to work with super tempting new products of my choice is one of the biggest perks of being DT for India's premier shop for imported Craft supplies....Shalini Mittal's Crafters Corner....Shalini always brings innovative and amazing products from all corners of the world to India! 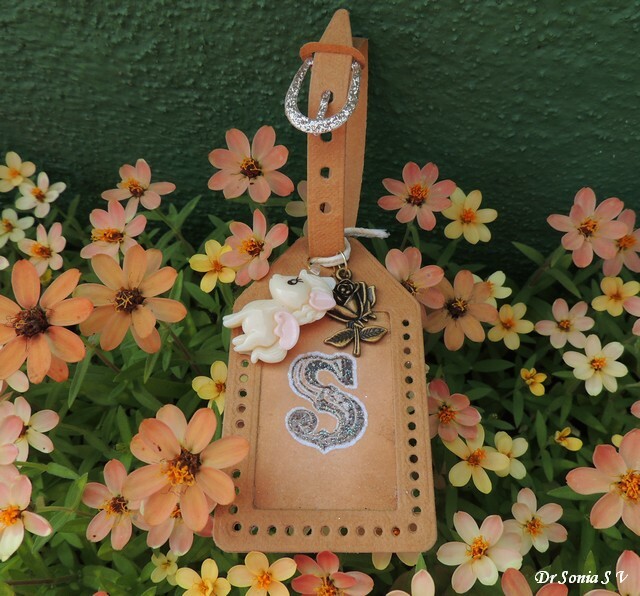 And C & T Publishing's Kraft tex is one product which has been selling out so fast that in fact I had to hold on for this post to go live as it had already sold out from Crafters Corner several times!! 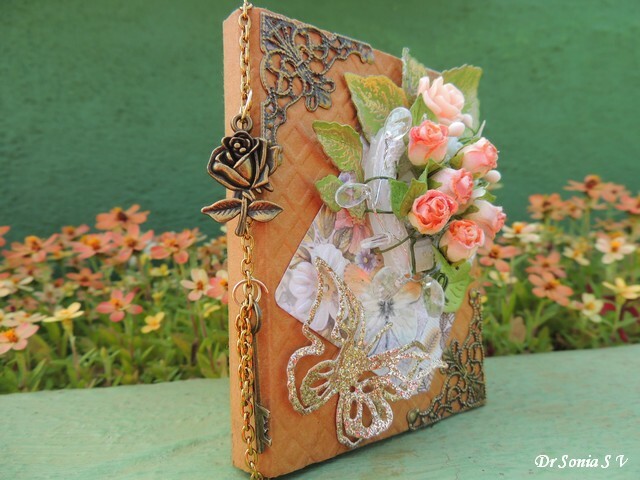 In this post I will share what is so special about Kraft tex and project ideas. 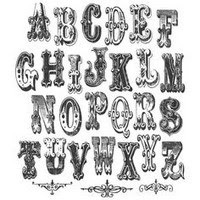 Kraft tex is a super special paper which looks and feels like leather, can be die-cut and stamped on like paper and yet is supple and strong like fabric and the ultimate is it can even be washed and ironed!! Why is Kraft tex so special? 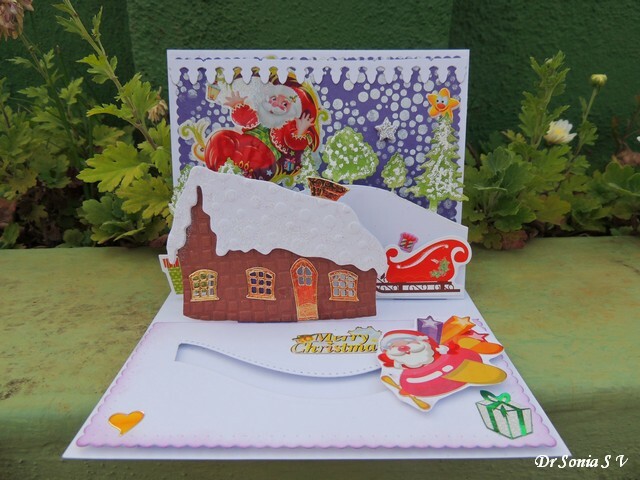 What is so special about Kraft tex and why it is so popular with paper crafters is that it has all the properties of paper which we paper crafters love [can be die cut, stamped, embossed etc] but yet is strong and durable and can take wear and tear. 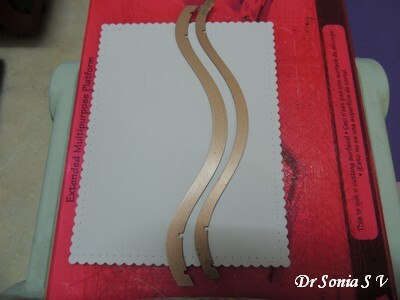 So it is highly popular in making albums, books, bags, wallets and any project which needs to withstand wear and tear! 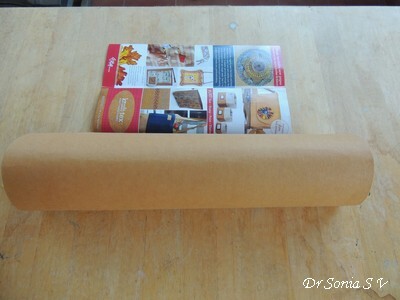 Kraft tex is sold in huge rolls of 18 x 54 inches and comes in many colors , the most popular being natural and black. 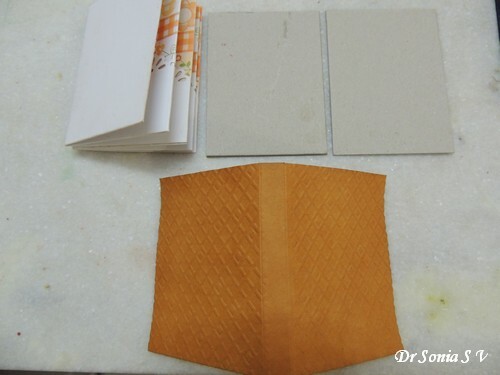 I have used natural Kraft tex in my projects as I love the leather look of this shade of Kraft tex. The rolls are huge and value for money as you can create so many projects from a single roll. 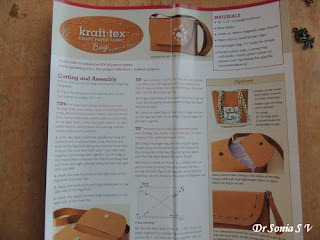 When you buy a roll of Kraft tex you even get a free Tutorial with detailed pattern to make a handbag using Kraft tex. Kraft tex is so popular that there are even books of sewing projects using Kraft tex !! How to Use Kraft tex ? Kraft tex feels like a thick leather paper. 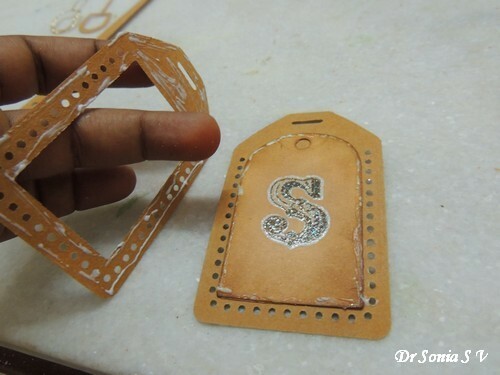 You can cut it with normal scissors and even die cut it with thinlit /wafer thin dies. Cut out the required amount, crinkle it, soak or even boil it in hot water and either smoothen it with your hands or iron it and use. Another way to get a crinkled leather look is to wash it in the washing machine and after drying ,iron it using your iron. Because of the fibre content in Kraft tex it will not tear even on machine washing...isn't that cool!!! I scored and embossed a piece of Kraft tex to form a sturdy cover for my mini book.Left the spine area unembossed as the spine would look better un textured. 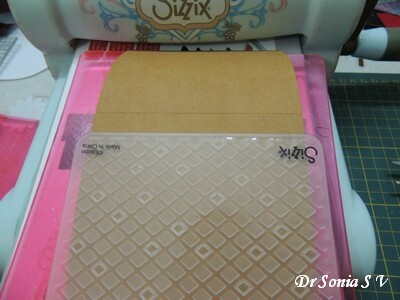 A tip to follow when using Kraft tex in album making is to use a strong wet glue like Aleene's tacky glue rather than red tacky tape as it gives a stronger adhesion. 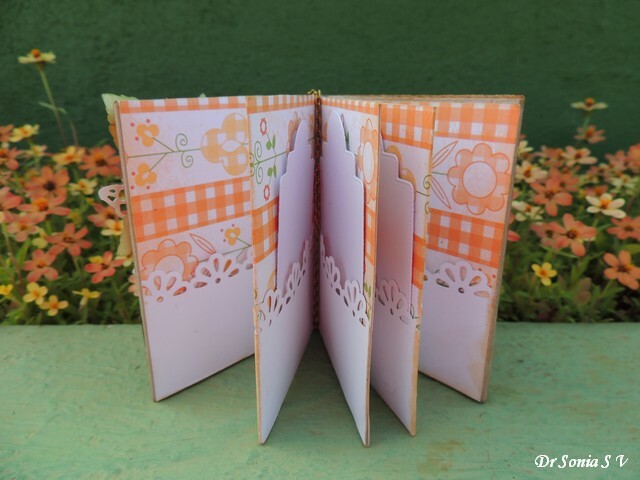 Here is the inside of my mini book/album with pockets and tags.This book was made with a single sheet of 12 x 12 inch pattern paper and has 8 pages with pockets to hold 8 tags. I used 4 x 3 inch piece chipboard on the front and back and wrapped the whole thing in Kraft tex for extra strength. Added a golden chain with cute metal charms on the spine of my book . 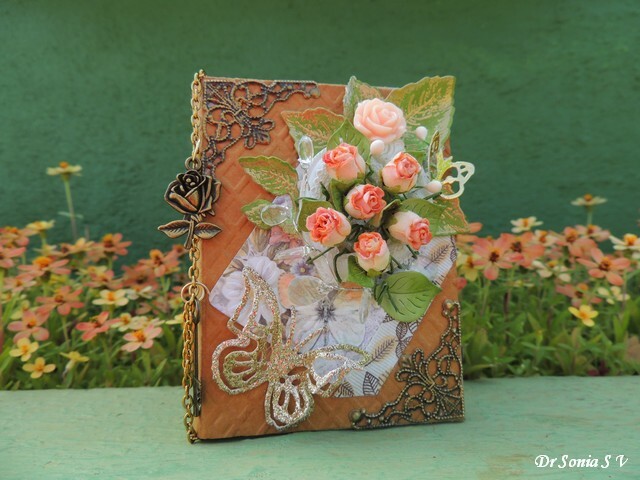 Created the main focal element on the cover by twisting rose buds around a resin heart and adding leaves galore [Cheery Lynn leaves and Heartfelt creations leaves] plus lovely crystal fillers. All the metal charms and embellishments got a nice rubbing with Inka Gold. 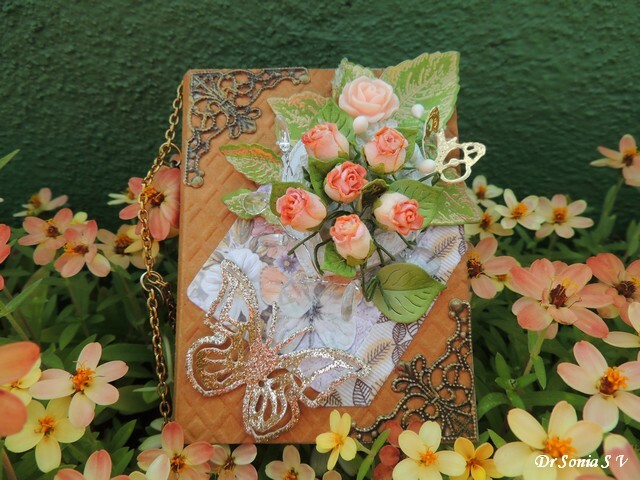 Do scroll down the post for links to all the products I have used to make this mini book. I thought I would use this handy little mini book to hold the numerous lists I keep making.I am a lists sort of person and love to jot down to do lists , shopping lists, goals etc etc! 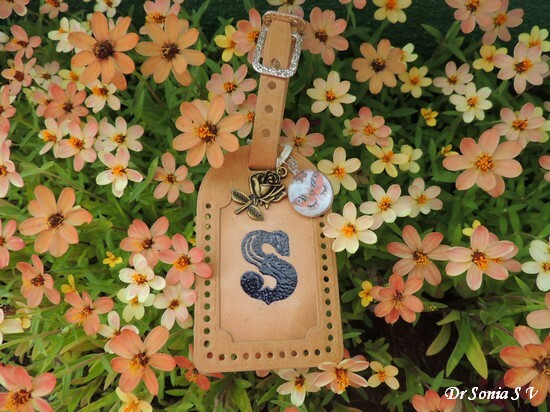 My second project using Kraft tex are these easy to make strong and cute Luggage Tags. 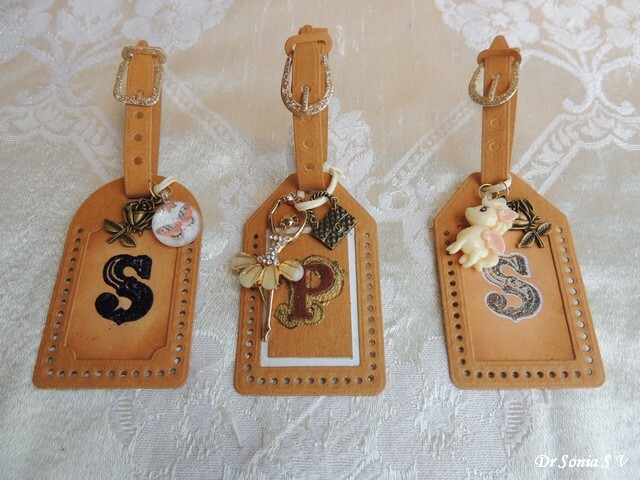 To make these easy DIY Luggage tags, I die cut Kraft tex using Xcut Luggage Tag dies though you can use any nesting die you have or hand cut your tag shapes. 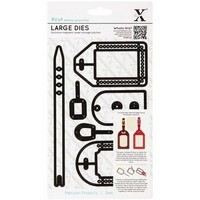 How easy is it to die cut Kraft tex? 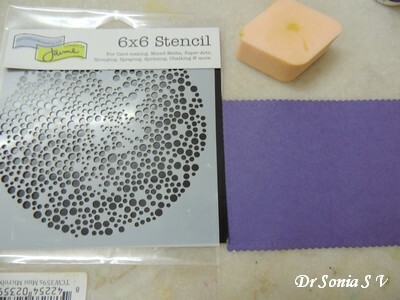 It is super easy...and see how clean even the tiny circular apertures on the side have die cut...! 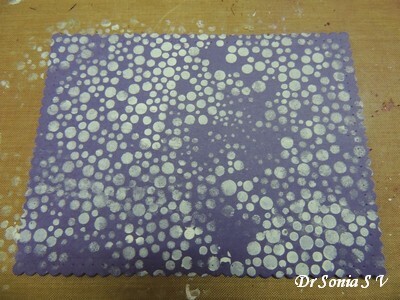 Though Kraft tex has many properties of cloth it is not difficult to glue . I used Aleene's Fast Grab tacky glue not only to glue paper and ribbon to Kraft tex but also one layer for kraft tex to the other. 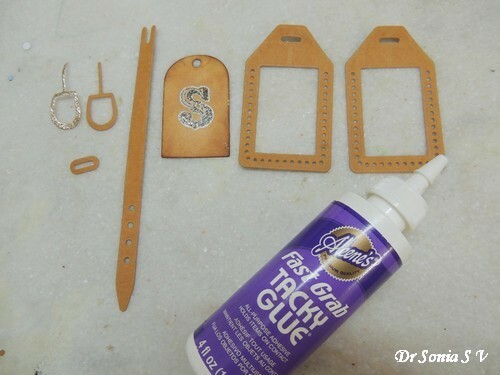 Love this glue which Shalini sent me in my DT pack.It is sticky but not irritatingly sticky if it gets on your fingers, dries fast and is very very strong. 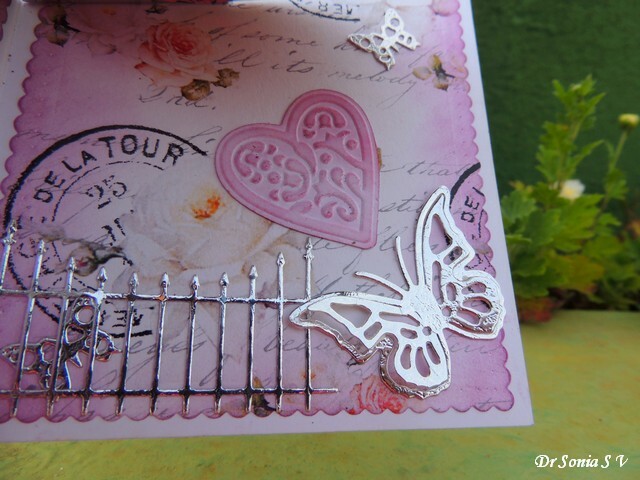 I wanted to see how well Kraft tex took inks and so stamped on it with a variety of ink-pads including Memento and Archival ink using alpha stamps .Also experimented using Embossing Powders and loved how sturdy the material was in taking the blast from the heat gun. In the tag below , the central part is normal white card stock I inked with Tea dye and Walnut stain Distress Inks to match the color of natural Kraft tex . 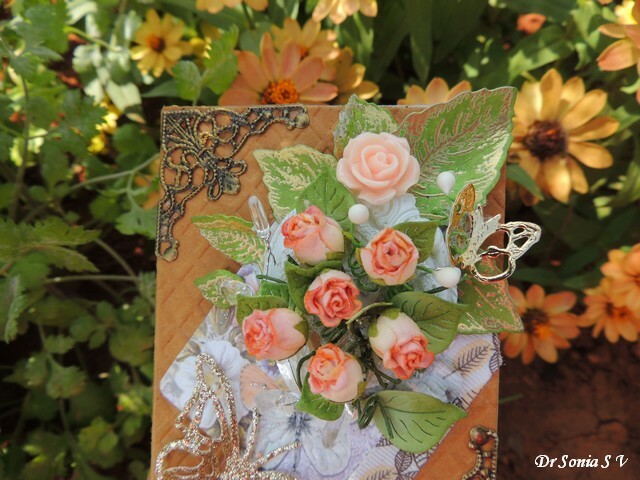 The shiny butterfly was made using glass cabochons, mariposa paper and a super useful Ultimate Back support which can convert anything into a hanging charm! Here is the Glass cabochon Tutorial. 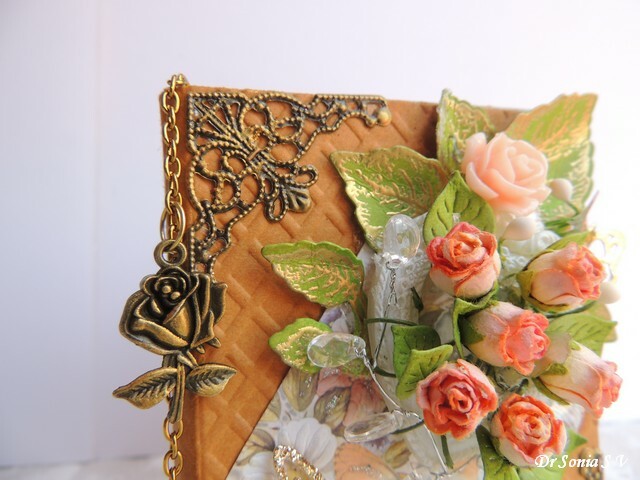 All the cute metal charms I have used in my Kraft tex projects were part of my Crafters Corner DT package and my all time favourite is the gorgeous golden flower girl!! 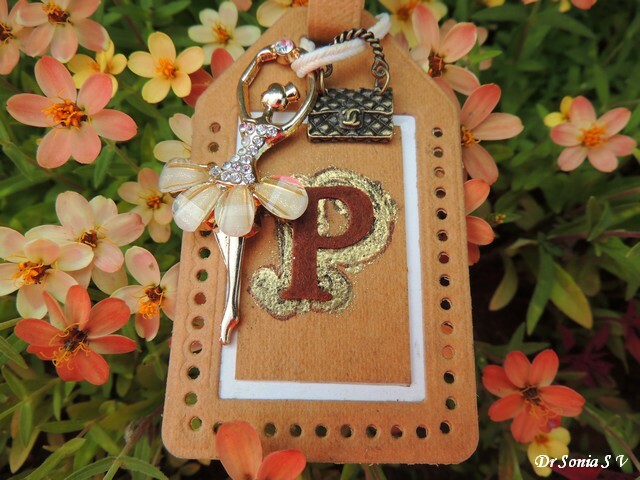 The monogram in this tag has gold embossing, outlining with a Sharpie and a die cut felt P.
I hope you liked my mini book Tutorial and Kraft tex projects...do tell me.